I wanted to know that if I had a particular speed of RAM in my PC, whether I could put a higher spec in there in a larger size, i.e. currently I have 2x 1GB simms and want to upgrade these to either 2x 2gb simms or 2x4gb simms, but I cannot get these sizes in the speed that my current RAM chips are for my PC. After a bit of research I found out that you have to look at your motherboard documents! Motherboards only accept certain types of RAM chips, the ones it works with will be stated in the documentation. I would recommend checking model number on the board and searching online if the documents have been lost. If you get any different then the recommended type it may work ok to the reduced clocking speed, or just not work at all. I’d recommend checking the documentation. Sorry! Also – if you gambled and upgraded the size without consulting manual it could be the case that the motherboard could not take it. Older boards have a low limit so the max they can take is around 2GB. If you was to upgrade to higher then it could take it would only see maximum it could take. E.g it can take 2gb, (2x1gbs) you put it 4gb, it would either only see 1gb of each or none at all. 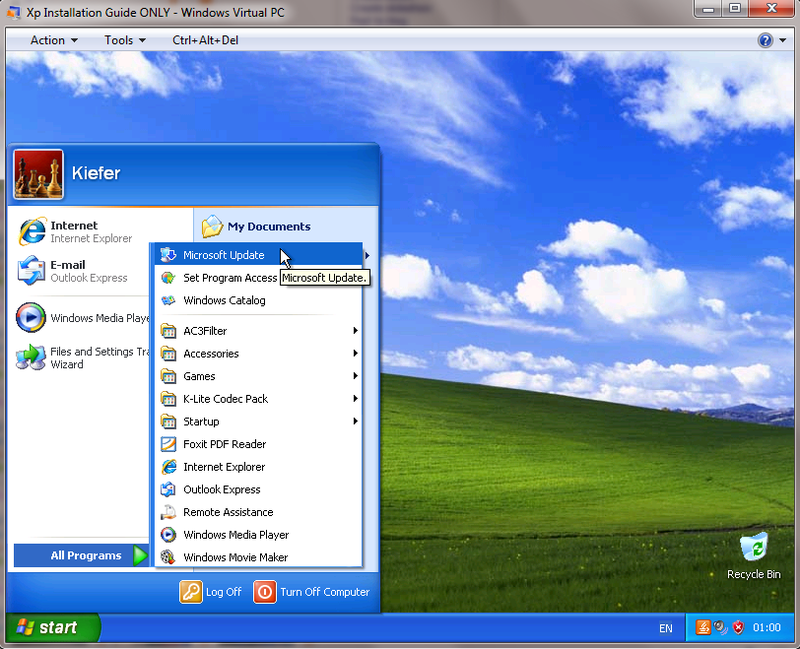 This installation guide uses a cracked copy of Windows XP Pro. This is only for training and guiding purposes and I am not advising anyone to use illegally obtained software. This copy does not include a Serial Key, when you reach the stage when you are prompted for a serial you must input the key given when purchasing the software. 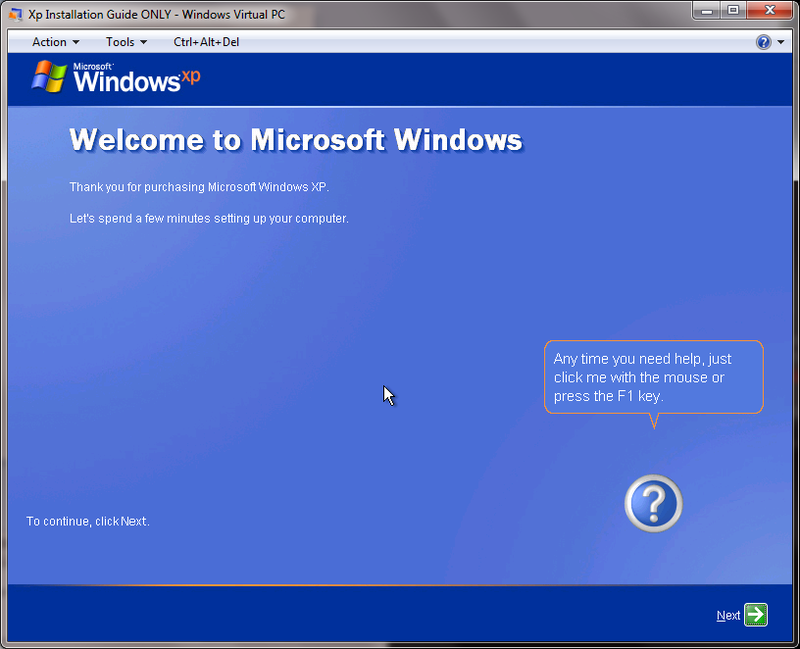 I am providing a step by step installation of Windows XP Pro, All other versions of XP installations are very similar to this and any average user can easily install XP after reading this guide. 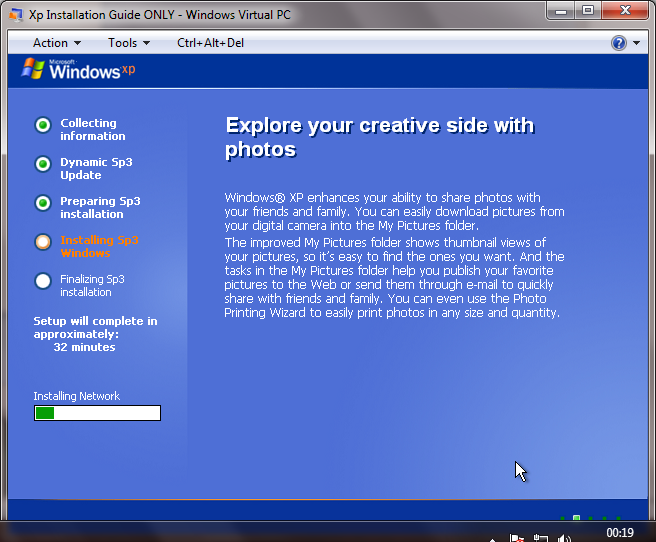 I am including screen prints of the installation whilst using Virtual PC to install XP. 1. Place the windows XP disc into your CD/DVD Drive. 2. Restart you’re computer and await for the stage which says “Boot from Disc press any key” hit any key. 3. 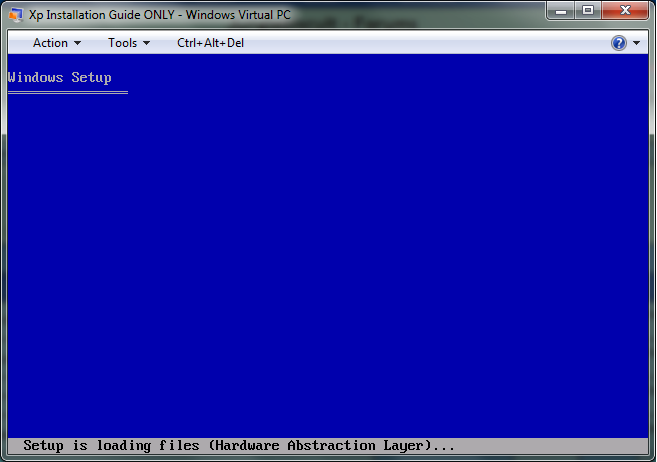 After hitting a key a blue screen will appear looking similar to this, this screen will change whilst the software analysis you’re computers hardware. Allow this process to continue until you arrive at step 4. 4. You will now be at the stage in which you are prompted to select from either the following partitions or to create a partition. installing i have no need to create. 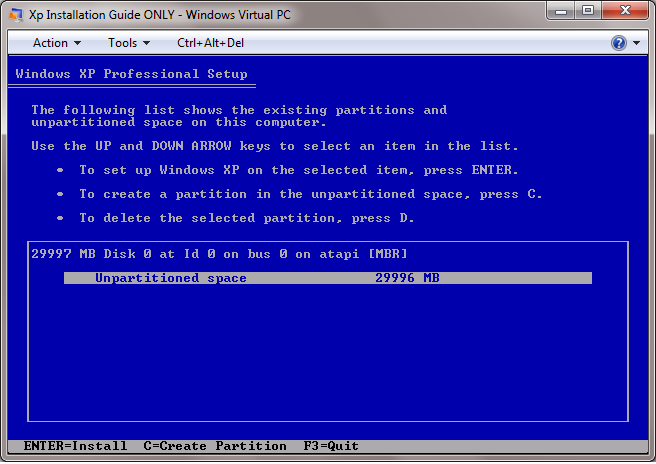 Creating a partition usually is used for duel booting OS’s or backups. Press Enter to install and then continue onto step 5. 6. This step will format the partition/s you selected to NTFS format so that files can be copied over and the OS can begin to be built. 7. 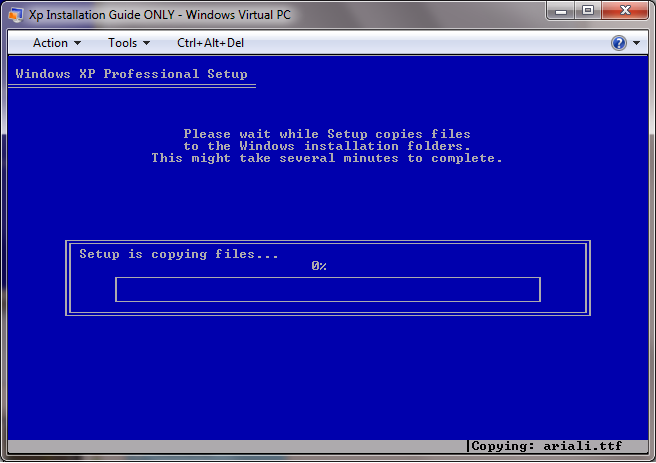 Step 7 is the time when the software has now completed the format of the space allocated for the system to use, now it will begin to copy over the files in which it needs to run the computer formally known as "System32 and System"
8. 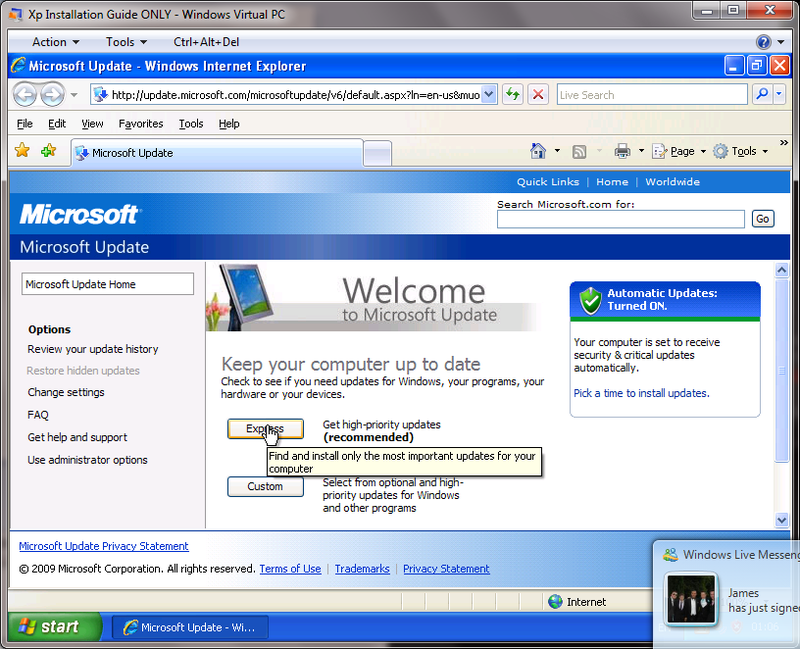 Once the screen changes to the following, Xp has finished copying over files and folders and will start to initialize the actually installation of simple drivers, time and date settings, language and keyboard settings etc. 9. You’re computer will reboot after step 8 and you should see the following screen. 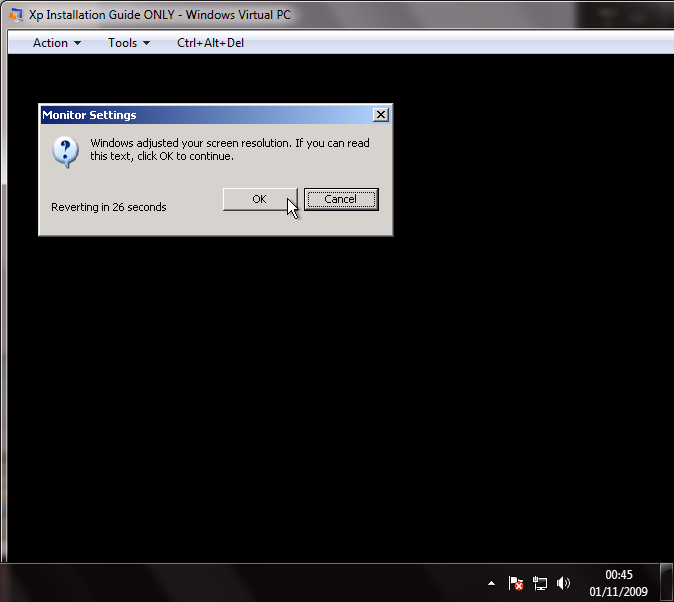 Allow this to load without fault and hesitation i.e. do not turn off you’re computer. 10. This screen is the start of the configuration process allow this to work through until it displays "Setup will complete approximately: 33 Minutes" At this stage you should follow from step 11. 11. 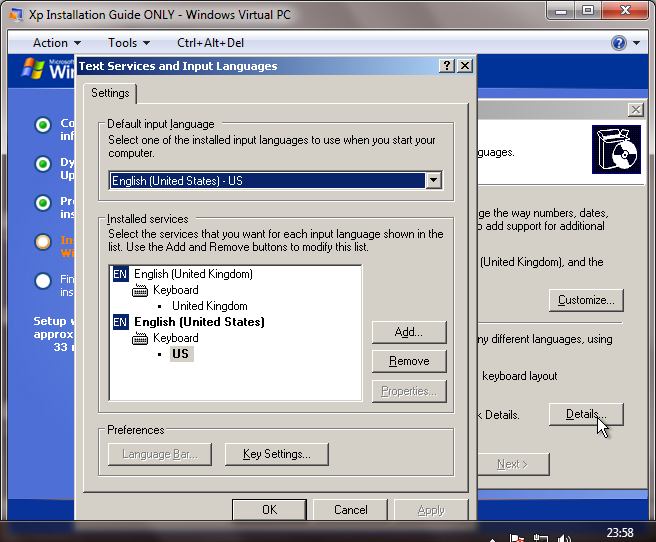 This step is the start of the language configuration. If you live in the US skip this step. From here you need to click "Customize" this will bring up another windowing prompting you to select the regional language you wish to use. Choose you’re desired language from the drop down menu then choose the same location from the drop down menu below and press "Accept or Apply"
Now you will need to press "Details" this section is for the keyboard layout, if you do not select the right one you will start typing in the incorrect language I.e. if you are English and want to press the @ key you will find you are actually typing " instead. From here you need to change the language of the keyboard to english from the drop down menu. 12. Step 12 is the stage in which you need to select a name for the installation i chose my name of course. Enter the details into the corresponding fields i left "Organization" blank as this is a home installation and not for a company. After you have entered you’re details click "Next" and you will be prompted with a new window containing the drop down menu for the timezone in which you live in. 14. 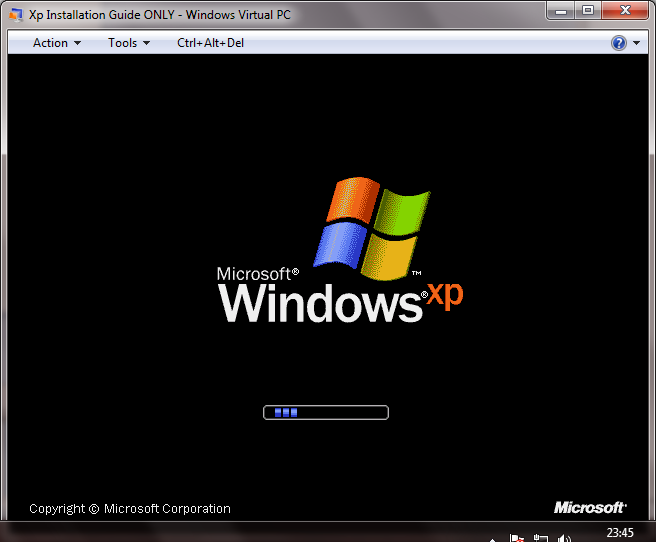 Once you receive this image, XP has finished preparing the installation and configuration and is now applying the settings and actually installing. Await the next stages. 15. 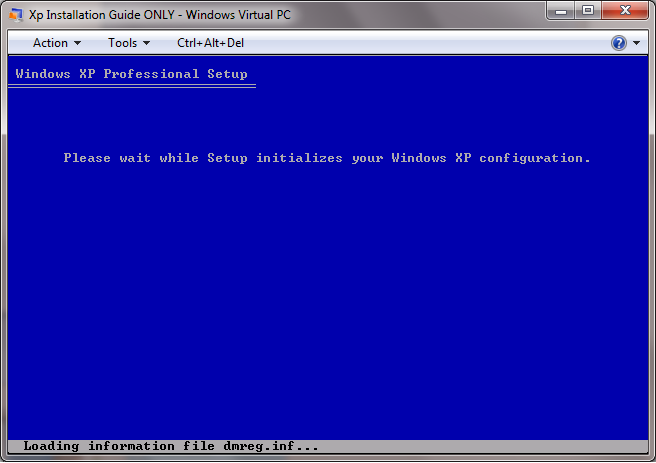 When you receive this image, the XP installation is completed and is now finalizing the installation. Be patient and wait a little more for it to complete. You’re computer will restart after the installation is finalised. 16. 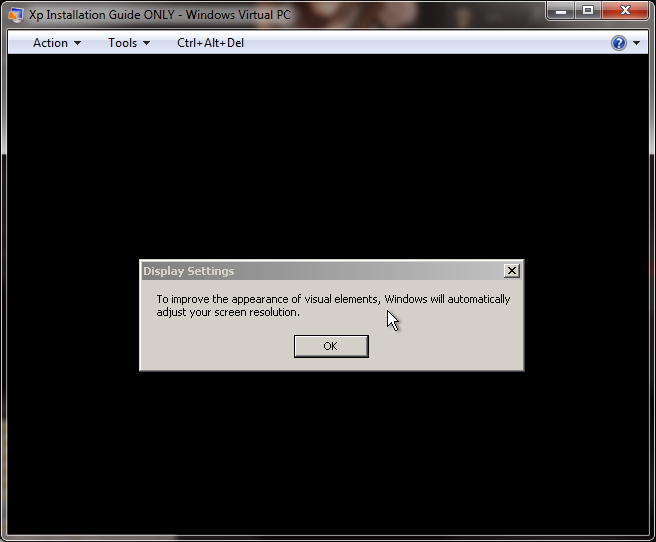 Now that Xp has finished installing it will attempt to auto adjust the screen resolution to fit you’re monitor and graphics card. Just click OK.
18. 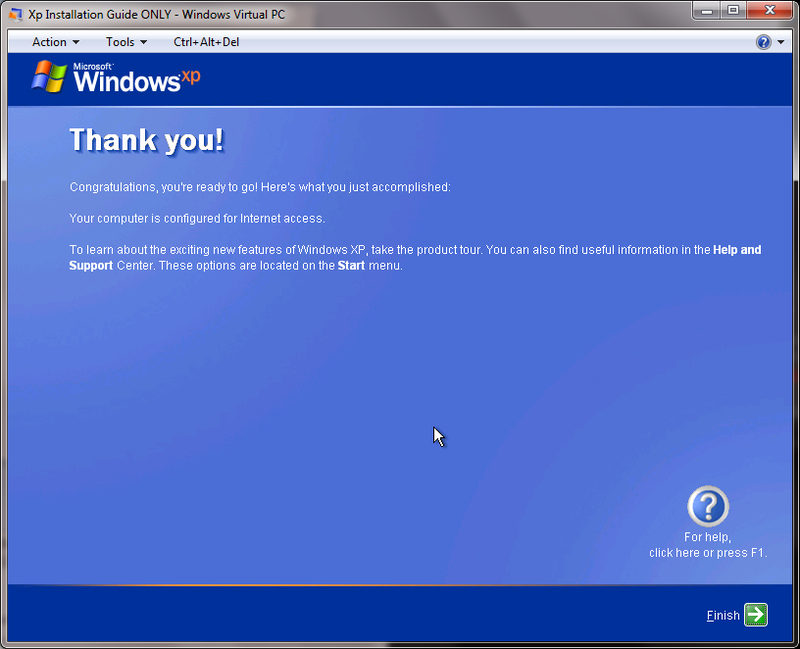 Congratulations and welcome to Windows Xp you are almost finished. 19. 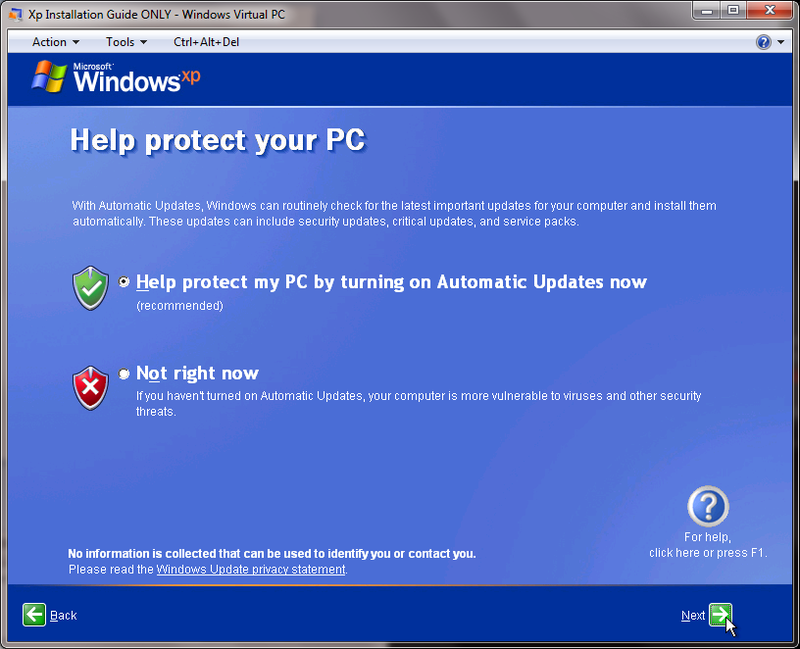 On this stage I recommend selecting the green shield option, this will automatically update from the windows server whenever there are new updates. Click "Next"
20. 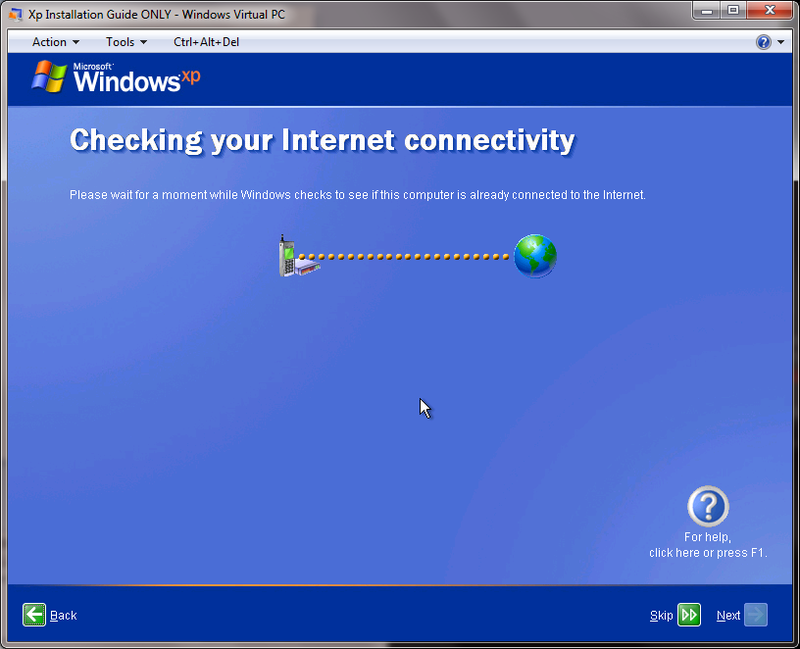 This step is where XP will attempt to identify if you are using a wired connection to a network or Internet connection. 21. For this stage keep the default selection "Yes it will connect through network etc"
22. 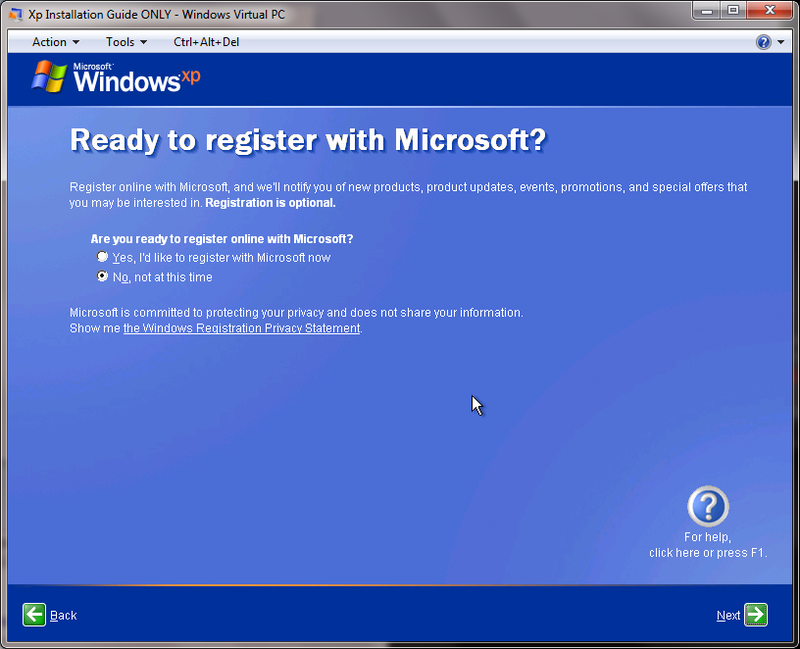 On this stage i am using no to registering with Microsoft as I am using a cracked copy of windows. 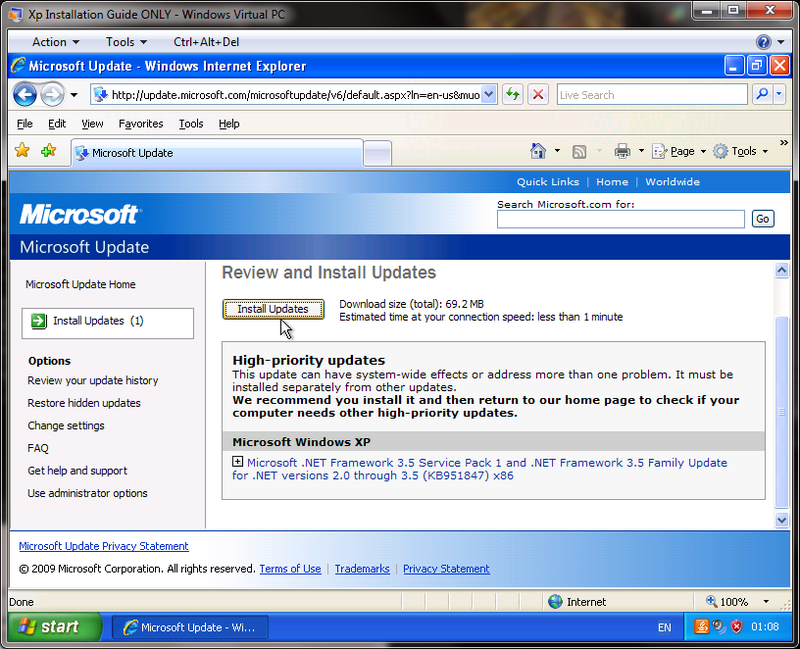 I do advise you to register with Microsoft if you are using a legal version it will benefit you. 23. This stage is where you will be creating the account names for the people who will be using the computer, i used my name as its my installation you can use whatever you like. 24. 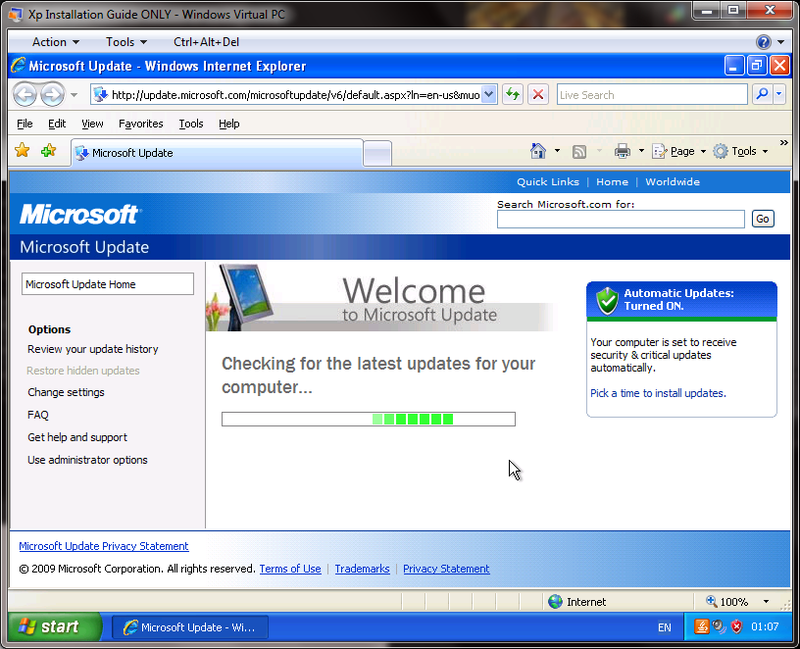 Well done the process is now over, officially welcome to XP hope you enjoy you’re stay and never upgrade to Vista! 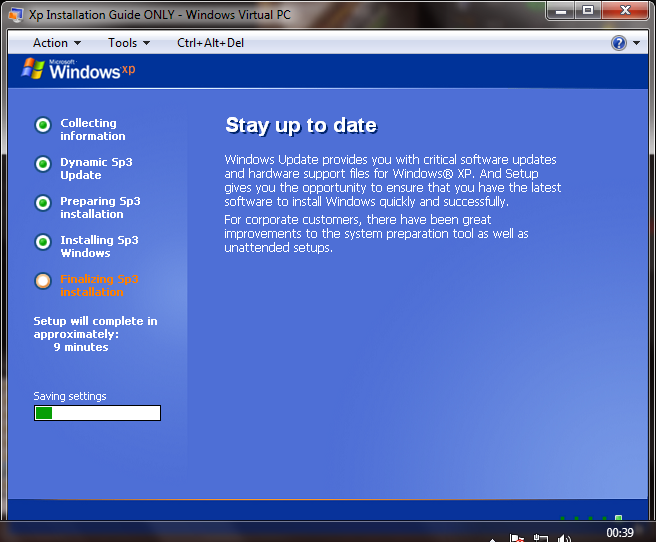 Go to "Start > All Programs > Windows Update"
28. 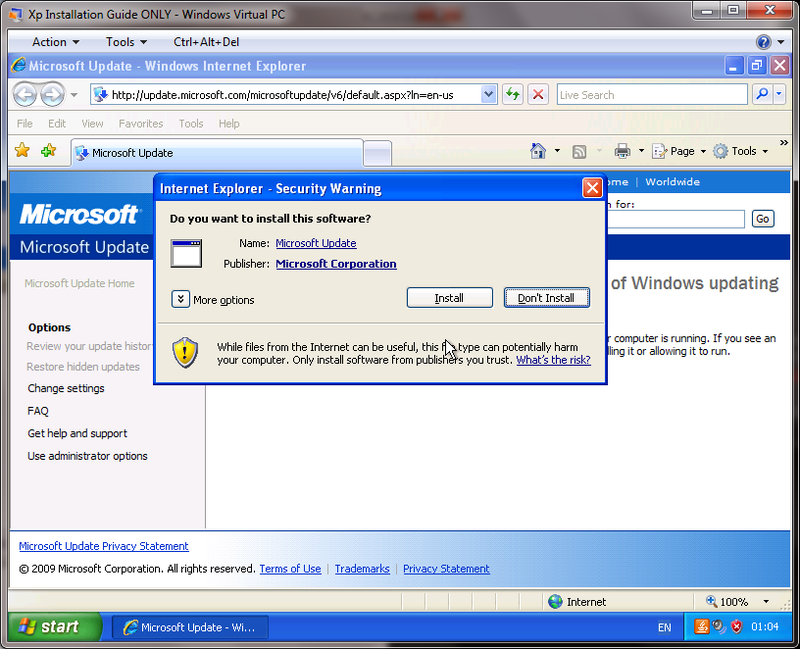 Click "Express" This will initiate a search of the windows servers for any updates that you’re computer may need, this also only works with Internet Explorer as IE has a inbuilt feature to search you’re systems hardware and then locates any drivers it may need. 29. 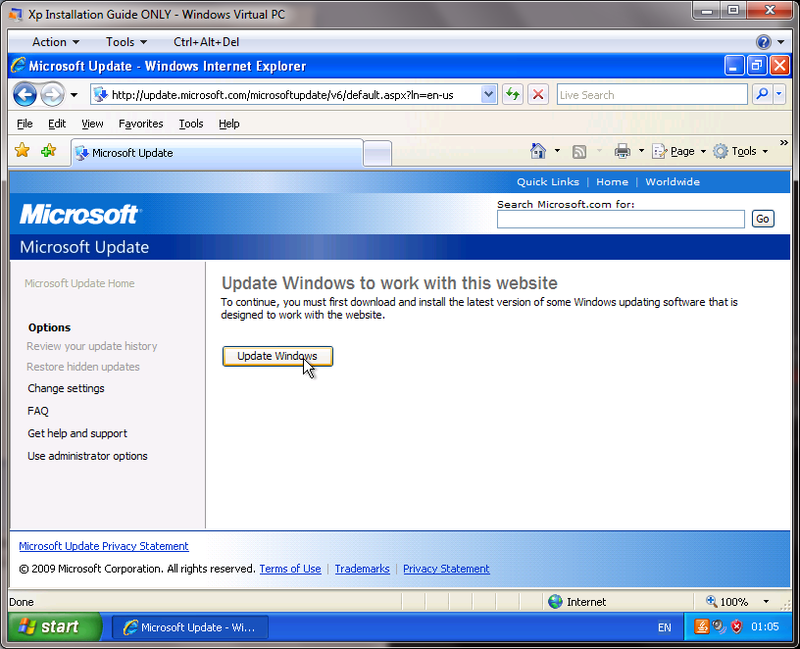 Allow the green bar to continue to go across and don’t exit the web page this is now searching for those updates. 31. Once the installation has been completed you may be asked to restart you’re computer if you are not you have two choices you can either redo the entire update process just exit the window and follow from stage 25. Stage 26 & 27 will not reappear as you have already installed them. Again do "Express installation" once you have repeated this step if nothing appears to installm restart you’re computer and then try again, after two or three times of this restart you’re computer again and then repeat the process using "Custom" this will enable you to find any that windows do not think are necessary but you may want/need them for you’re own personal use. 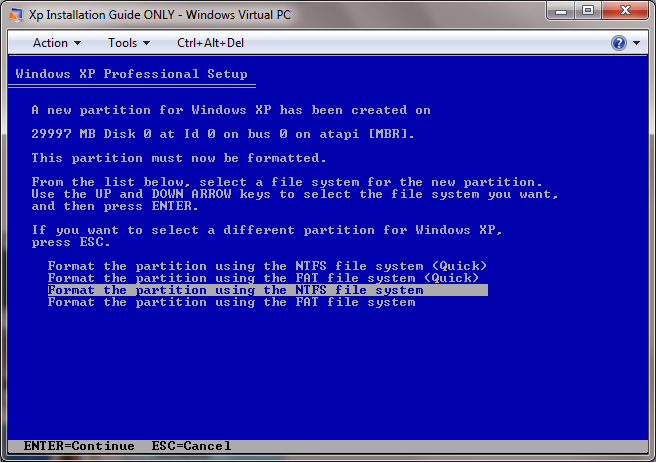 Congratulations – XP is now fully functional with Service Pack 3 and all necessary updates installed. As you may or may not now, many clans and guilds online use ventrillo for events. 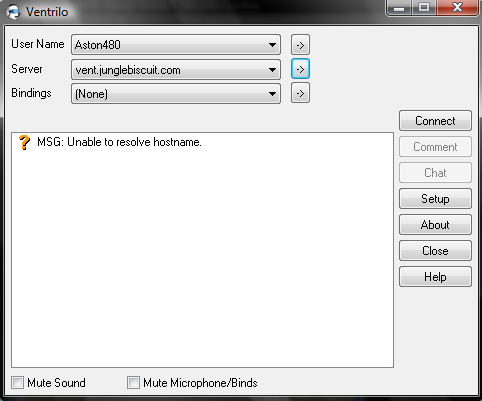 Ventrilo (vent) is software for quality voice communication via the Internet. Basically, its a program that lets you listen/talk to other players. To begin, you must first have the ventrilo client to connect. Its Free! When you’ve downloaded, open the file, and install. 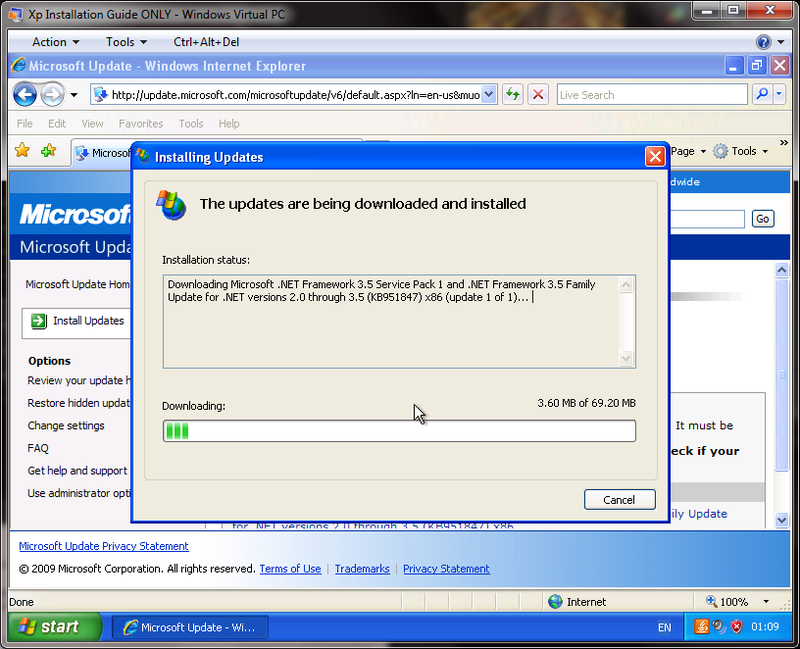 This will be a process of opening the downloaded file, click next untill installed. You are now ready to follow the guide. Click the right arrow next to the box in the picture. 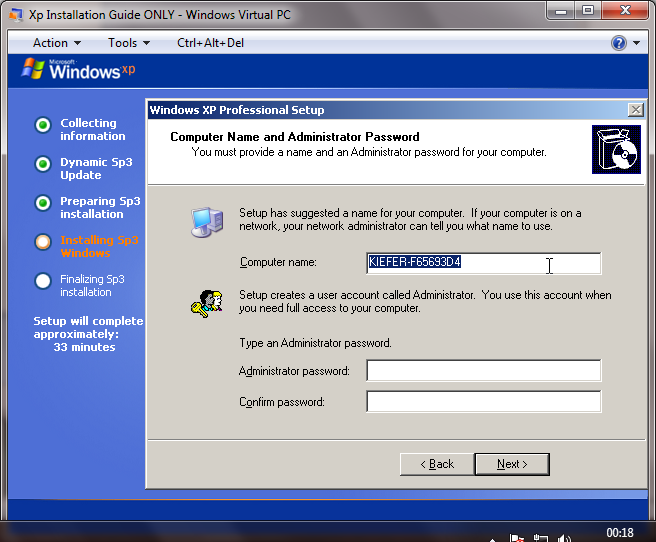 Press New to setup your new username as shown by the picture below. After you put your username, you can enter it in the box that shows up. After you choose a name, make sure you tell the server how to announce your name when you join. You can play around with to make it sound like your name. After you are done, click OK and continue the guide. 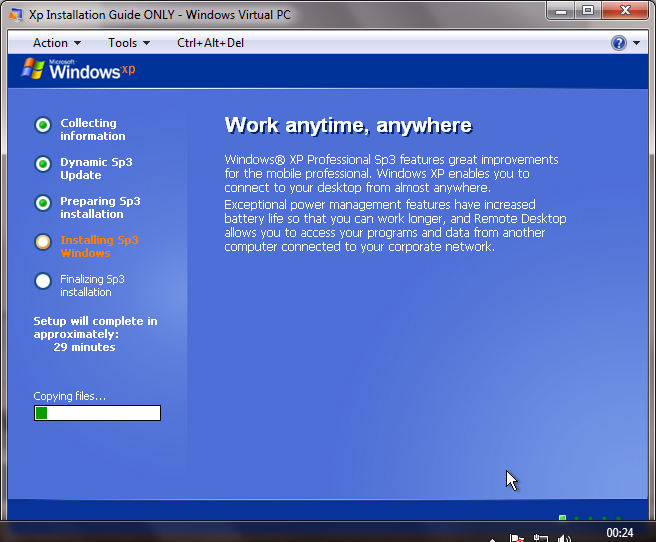 Once you have setup your name, click on the middle right arrow at the top of the Ventrilo window. This will take you to the server setup page where you will tell Ventrilo the connection information. 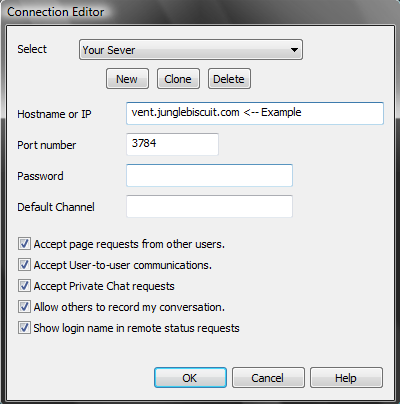 On the server setup page, or “Connection Editor” click new to add a Ventrilo server to connect to. Note: You can have more than one server in this list. Name the server something that you would recognize. Note: Get the connection info from the owner of the server or anyone who you know has it. Port number: Ask anyone in the ventrilo for it. Password: Optional on servers. If there is a password then you will need to enter it. Click OK and continue the guide. Then press connect on the right. If you can’t connect re-follow the guide and focus on the problems listed below. * Wrong information entered in the server setup section – This is the most common problem so check first! * Double check IP/Hostname/Port in server setup. * Make sure you are using a password only if there is one. * Make sure you are connected to the internet. As you may or may not now, many clans and guilds online use teamspeak for events. 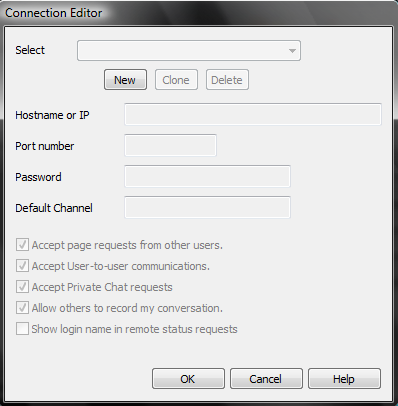 TeamSpeak (TS) is software for quality voice communication via the Internet. If you want to talk, you will need a mic. If you havent got a mic, its no big deal, you can listen to people on TS and they will tell you WHO to acttack and WHERE, you will need speakers to listen. The best thing about TS is that its free and easy to use so get downloading now! 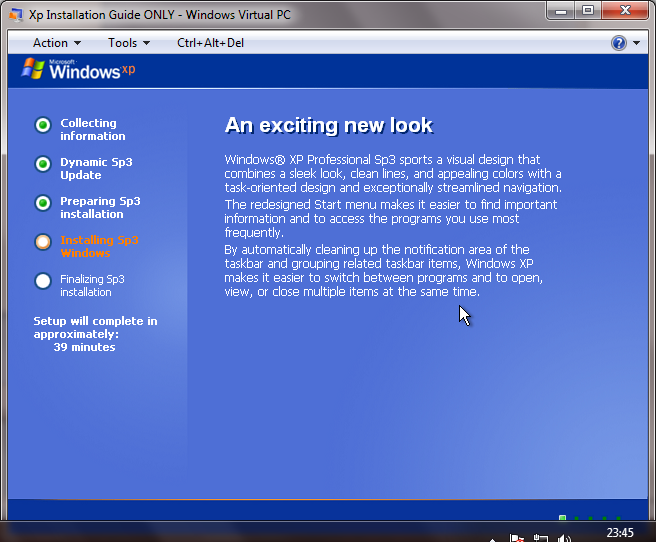 You will need to download Teamspeak 2 Client, it should be the top one. 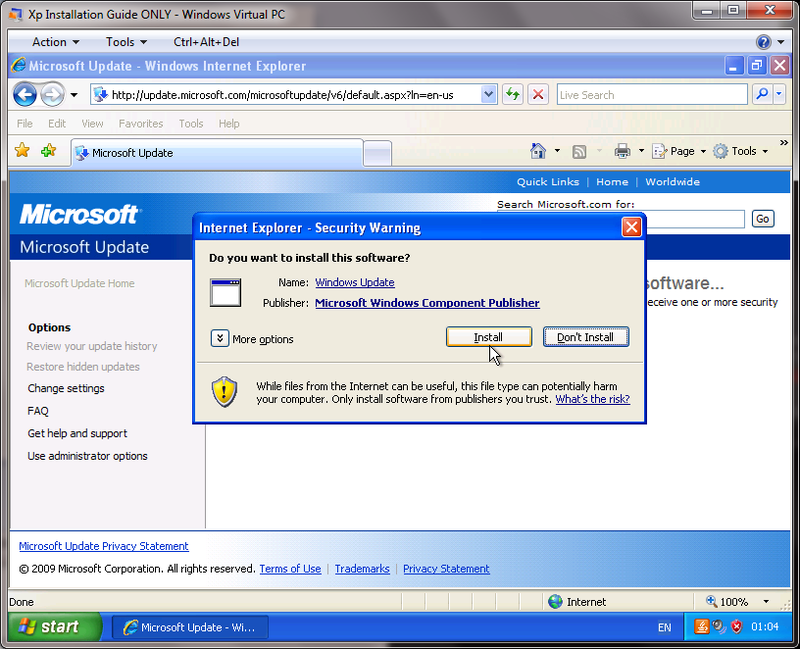 Either click Site 1 or Site 2, then agree to the License Agreement by clicking ‘I Agree’ at the bottom. This should take about 1 minute to do, dont think its long to set up by the length of this answer. So, open Teamspeak up (Should be in all programs or a shortcut on your desktop). 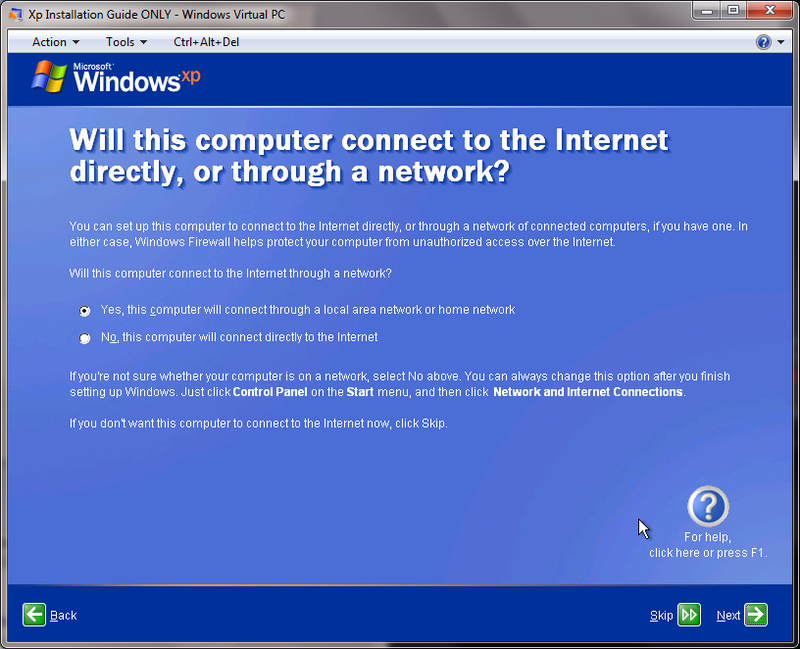 At the top, click Connection, then click Connect – This will bring up a little panel. Click the Local Addressbook tab at the top then right click Servers with the little box on the side of it. Then click add server. 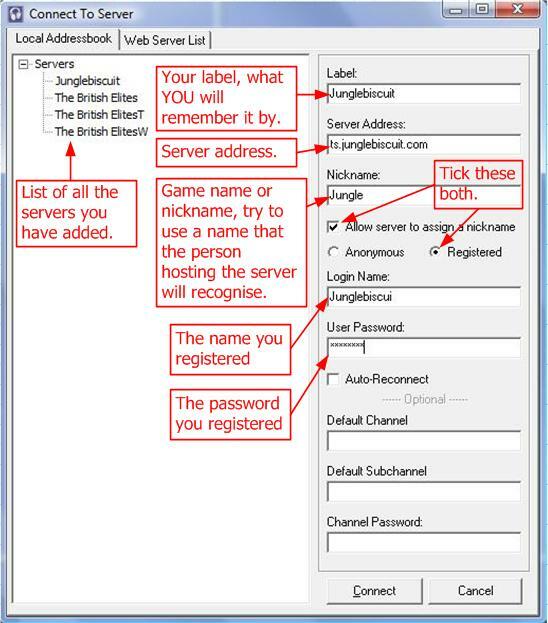 Label this anything you will remember it by, for example ‘Junglebiscuit Server’. Click the sever you just added and look on the right, there should be a form. 1 – Label should be already filled in. If not, label it anything you want. The rest of the form can be left blank. How do I register with the server? 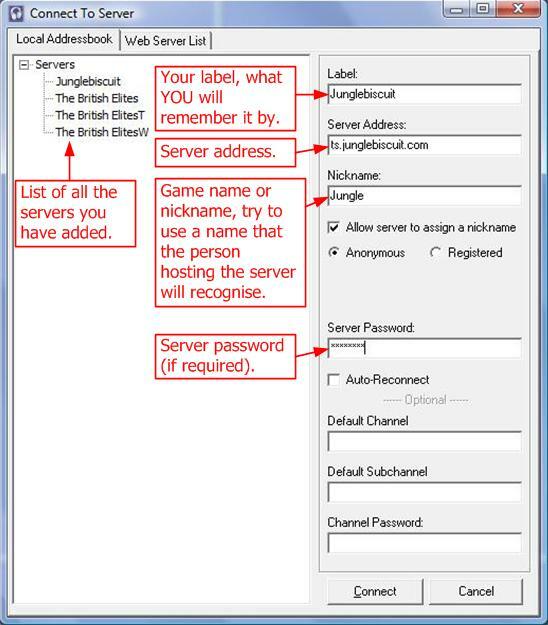 Once you’ve come onto the server, you will be allowed to remain unregistered or on some servers given access to register with the server – This means if the server keeps changing its password, you will be uneffected as you will use your own LOGIN and password, keep reading. 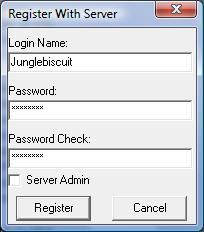 Once youve been given access to register, at the top click Self, then click Register with Server. Enter your desired name and YOUR OWN password, dont tell anyone your password. How do I log in with my registered account? Once youve registered, you will need to modify your connect form. 1 – Tick the Registered button instead of anonymous. 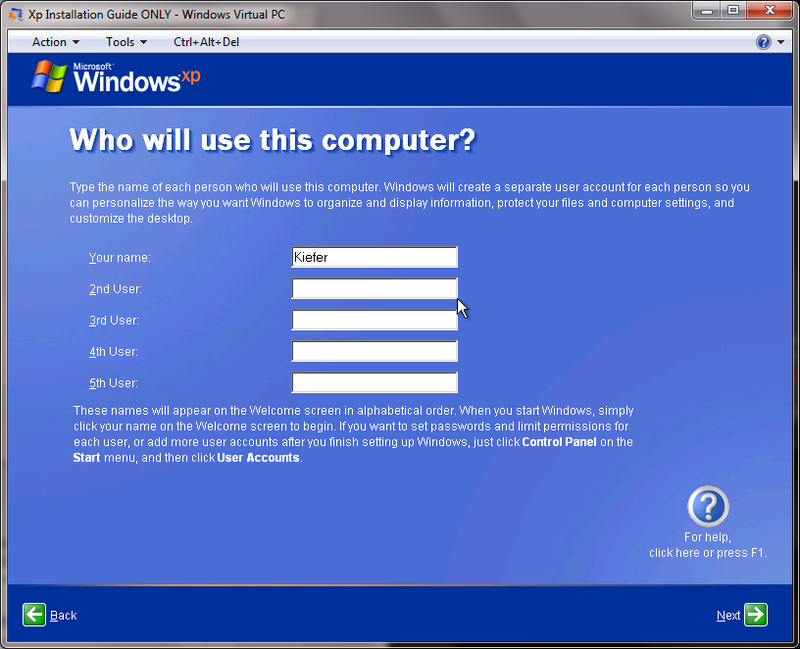 2 – Enter your login name (The one you registered with). 3 – Enter YOUR password. If you have a mic and need to set it up, at the top click Settings, then click Sound Input/Out Settings. Make sure you set it to Push to talk! Is there an quicker way to connect? If your to lazy to do the normal connect (That literally takes 2 minutes), you can use the option QUICK CONNECT. Click Connect and your good to go!